28 July 2011 - has it really been that long since I did anything on this!? Well, yes. Retirement and all sorts of family demands (including delightful twin grandkids) have taken their toll. However, the workshop revamp is almost finished and things are moving again. 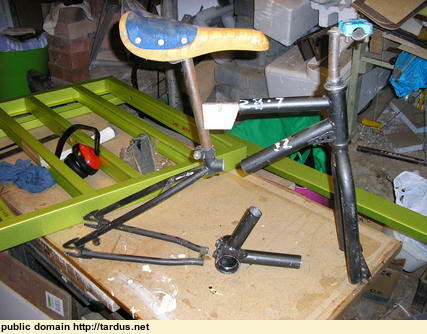 The next step is to join the front and back halves of the frame, ie, marrying up the square-tube boom with the cut-off rear part of an junk mountain bike that was given to me. 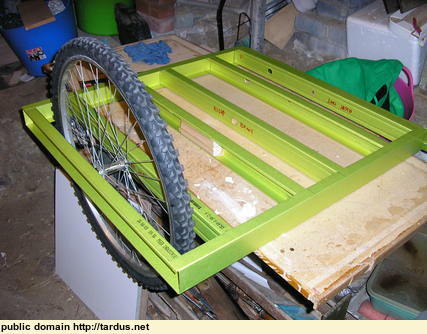 As I don't weld, and haven't the gear, and the bike frame is aluminium, it will be held together with steel plates and bolts. 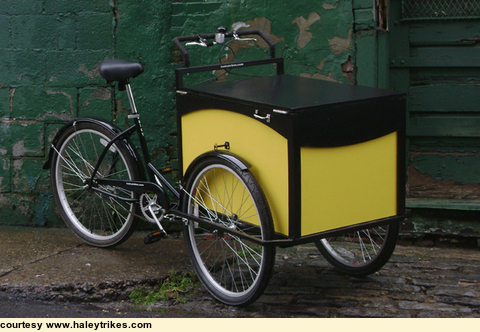 The wheelbase (ie, distance from the front axle line to the rear axle) is 1270mm (50") the same as the Haley Trikes (from the specs on http://www.haleytrikes.com). A mock-up showed the boom needed to be shortened (as expected - I allowed a fair bit of extra length when I made the boom last year - remember, there are no drawings for this project, just ideas and "try-it-and-see"). The ball cages in the old bottom bracket/pivot were cracked, so a new set was needed. 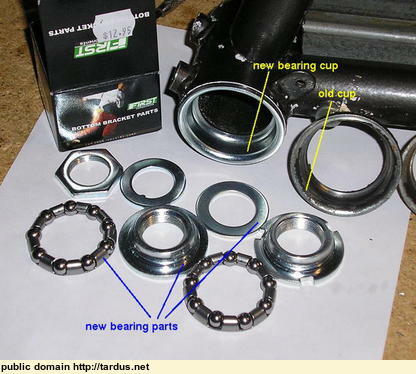 First bike shop did not have any, and the second had a complete kit (cups, cones, bearings, washers, nut) for $12.95. Very quick work to install them - the old cups had some corrosion too, so I'm more than happy with the fully greased and slick new set. 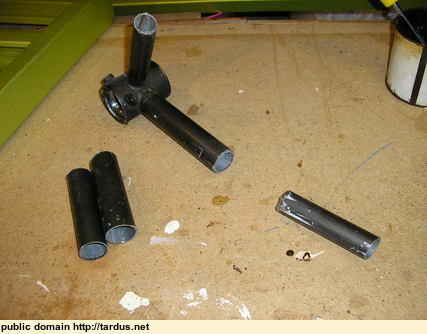 I've cut off the lower part of the one-piece crank - it was in the way and makes bearing work tricky. I think there will be ample rigidity without it. I've drilled a 1/4" hole through the stump - a bolt will act as extra security against the pivot coming undone, and gives the option of adding some lateral braces if it proves necessary. 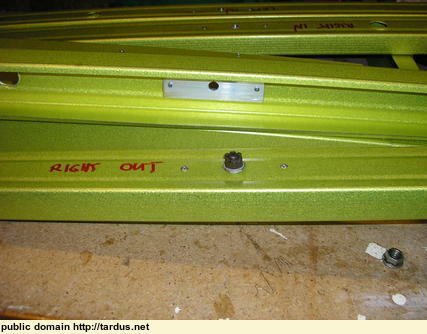 Here you can see the entire pivot and boom attached to the box frame. 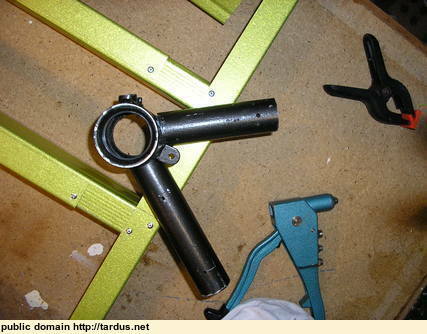 ... and a quick mock-up of the front frame and the cut-off mountain bike "engine"
You can see that I've replaced the 1/4" bolts holding the old bottom bracket to the square tube with 3/8" bolts. This seems to be very rigid now. 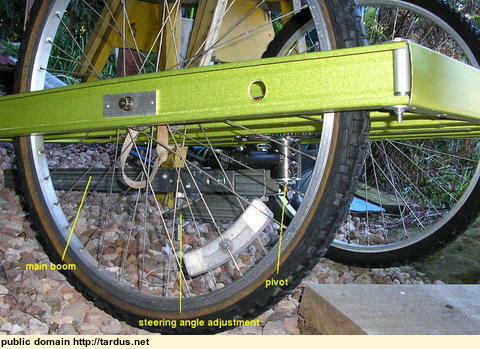 Note the 1/2" bolts for the steering angle pivot and adjuster - I do not want any slop or flexing here. 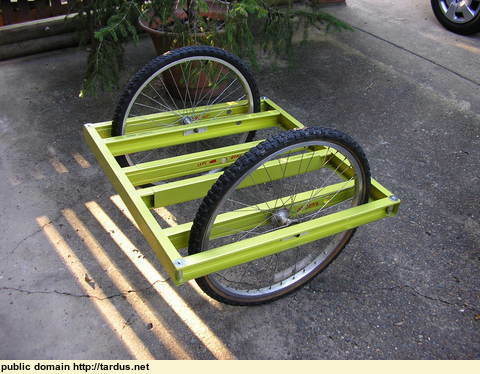 Despite the hefty appearance, the whole rig including the main boom is only about 4.5Kg (10 pounds). 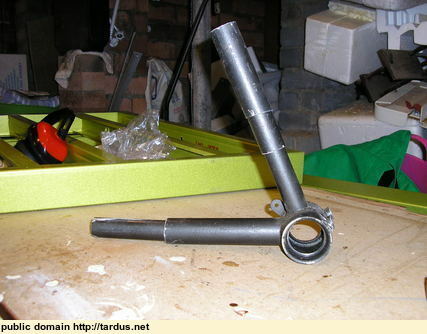 Here you can see the stump of the bottom bracket's seat tube. If the bolted connection proves as rigid as I hope the stump can be cut off. Otherwise I'll cobble up some sort of lateral connection from it to the the boom, to give greater torsional stiffness. 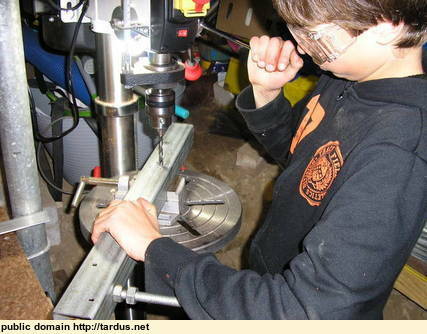 It was still a must to permit accurate drilling of the bolt holes through the main tube of the bottom bracket. 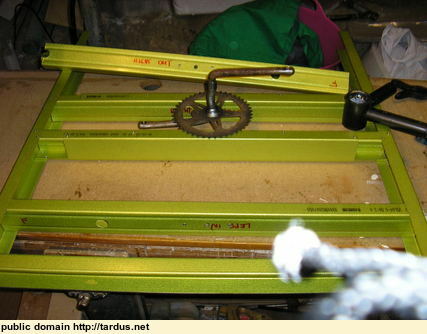 Being the same overall diameter as the main tube, the seat tube made the unit self-aligning on my drill press table. 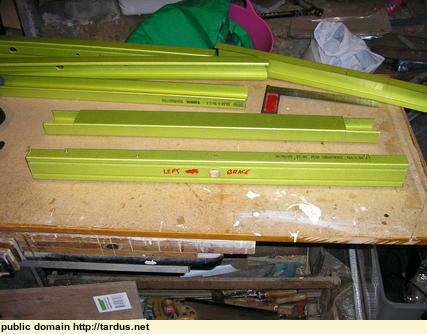 Here you can see the main boom, cut from a piece of 50mm square steel tube (2mm thick - yes, this will be a heavy trike - apparently that helps with stability. 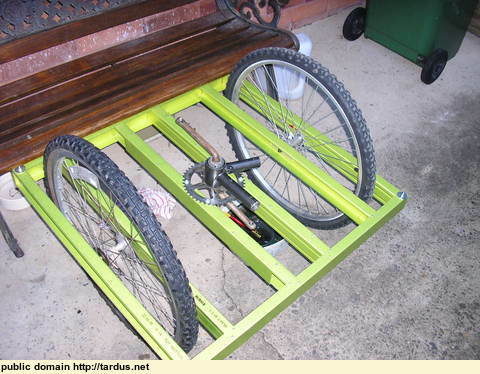 Pedalling it will no doubt save a lot on gym subscriptions ~8-D ). 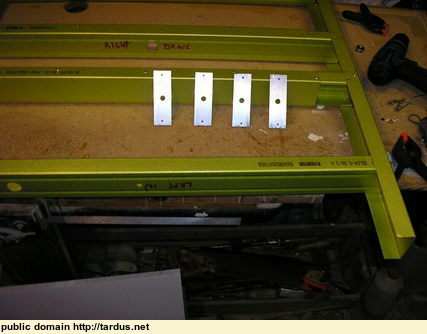 Some steel mending plates (40mm x 4mm in section) will splice a short piece bolted to the steering pivot to the main boom, which will itself attach to the cut-off bike frame at the rear. I've made it so that the steering angle can be adjusted, to try vertical, a few degrees forward, or back, to see what works best on the road. 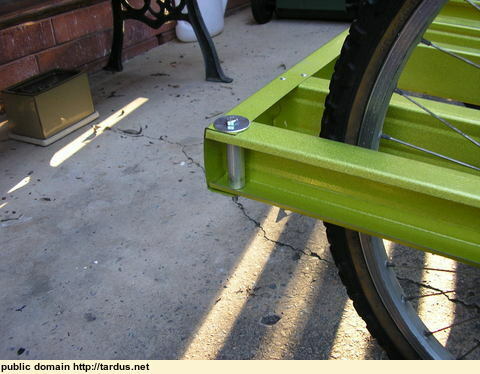 The bolts holding the pivot to the square tube are 1/4". If these prove to light, I can drill out the holes and use either 5/16" or 3/8". For now it seems stiff enough. The tube sticking out at an angle from the pivot is the stub of the seat tube of the donor bottom bracket. 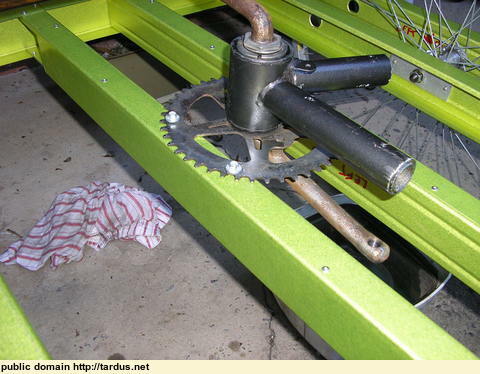 If needed, I can insert a stiffening plate between the pivot and the square tube, and bolt this stub to it, to improve the torsional stiffness of the boom to pivot joint. 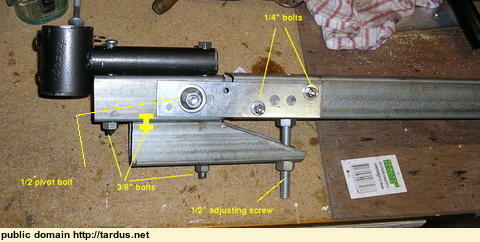 The adjustment pivot bolt is 1/2". 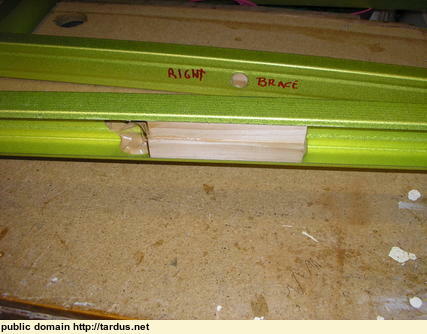 There will be a brace underneath, with an adjustment screw connecting it to the main boom. BTW - if you wonder about the mixture of metric and inch size bolts, while here in Australia we went metric back in the 1970s, the typical stuff you find at the local hardware is still inch sizes. Metric sizes are finally getting to be common (you could always get then from engineering supply places, but not the local). So, its a matter of what I can find at the time! 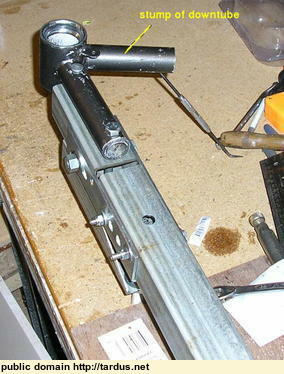 BTW2 - one of the most useful tools so far has been my Chinese drill-press ($99 a few years ago). 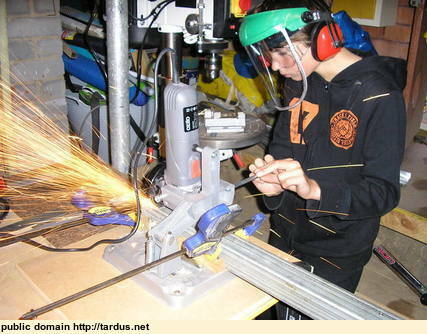 The ability to drill accurate holes in metal at low speed, at right angles, and with minimal effort, is such a simplifying thing. 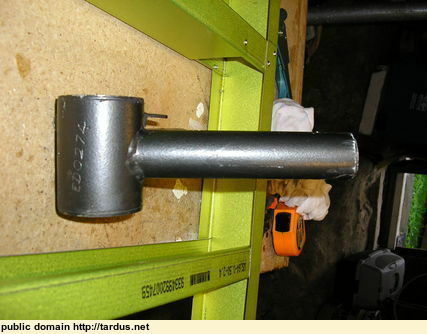 I doubt I could have drilled the holes in the pivot assembly and square tube accurately enough by hand. 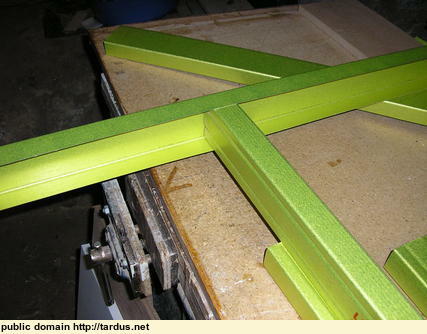 As it is now, the two pieces are square with each other and the bolted joint is nice and rigid. 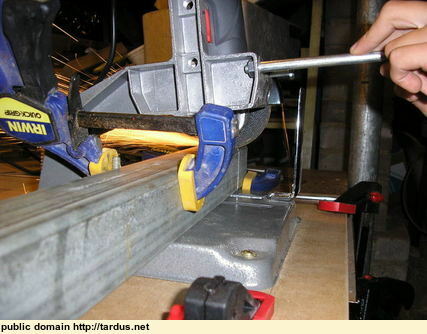 I don't have welding skills, so the frame is made of thin steel channels used for house framing. These are 64mm x 34mm, and the studs nest with the channels closely. When pop-rivetted the box section becomes torsionally stiff. 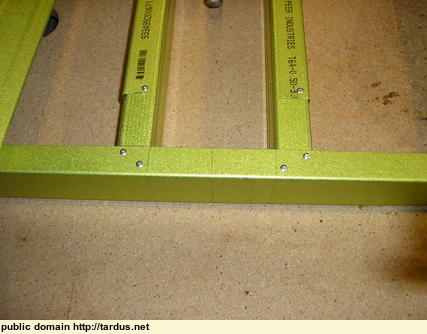 Wood stiffeners are inserted in the middle of the centre channels. 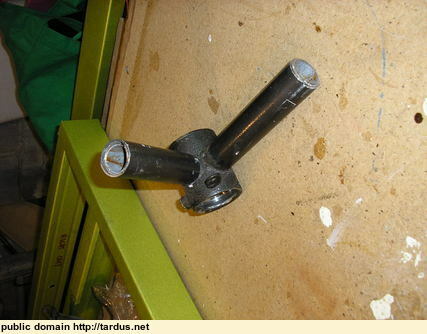 This is where the pivot will attach, and needs to be rigid. The wood is glued in place with "Maxbond", a cheap and tough gap-filling construction cement (a "Liquid Nails" type product, but better at gap filling and bonding almost anything to almost anything else). 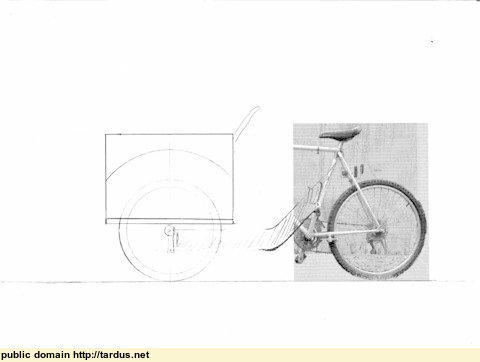 The pivot will be the bottom bracket from a junk BMX bike. 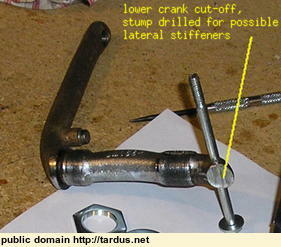 Here is the crank approximately in place, just to get an idea.